My Kingdom Review. Unfortunately for viewers he overindulges, and also lapses into melodrama on an unfortunate number of occasions, but those who like their epics lush will still likely get a kick out of this ambitious martial arts musical. Icon are either going to have to become more inventive with their local wuxia titling or start sending me the additional identifying feature of cover art, because this is starting to get confusing: in recent months the distributor has, in an attempt to satisfy the seemingly ravenous demand for visually sumptuous Eastern fare, released The 18 Bronzemen, 13 Assassins, 14 Blades, Blades of Blood, The Lost Bladesman, An Empress and the Warriors, The Warrior, Three Kingdoms, and now My Kingdom. Whilst I appreciate a big-budget period piece or Takashi Miike epic as much as the next fellow, even I’m starting to have trouble telling them apart. Complicating matters further is the fact Icon refers to many of these films as comprising their ‘Wu Xing’ collection, Wu Xing being a philosophical precept and mnemonic device, unless that hallowed source known as Wikipedia is mistaken. Presumably they mean to say ‘Wuxia,’ in reference to the Chinese martial arts genre, as would seem logical? 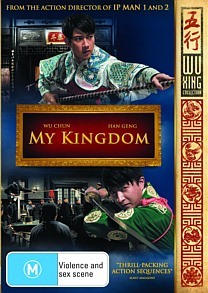 At any rate, my own burgeoning confusion notwithstanding My Kingdom is a decent enough flick. I don’t know if it qualifies as essential cinema, and certainly falls more towards the Empress and Warriors than the 13 Assassins end of the ‘Wu Xing’ spectrum, but it does contain an abundance of sumptuous visuals and proves an inventive, if uneven, take on the genre as a whole. Charting the fate of two adoptive brothers in early 20th century Shanghai, My Kingdom takes an operatic approach to its tale of honour, betrayal and revenge, and director Xiaosong Goa could not have picked a better project to indulge his clear love of period pomp and pageantry. Unfortunately for viewers he overindulges, and also lapses into melodrama on an unfortunate number of occasions, but those who like their epics lush will still likely get a kick out of this ambitious martial arts musical. None, just a smattering of Icon trailers.